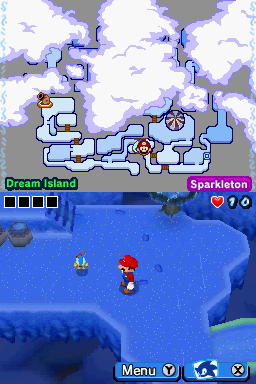 Sparkleton is a floating island which only appeared in Mario & Sonic at the Olympic Winter Games for the Nintendo DS. This place is where Sparky lives and also where the snow festival is held. After beating Eggman Nega in Frostown, Mario and company gain access to Sparkleton by using the cannon. Pola is held hostage by Dry Bowser here. Bowser Jr. sometimes pulls his mask over his mouth to disguise himself. Princess Peach wears dresses when she's at home in the Mushroom Kingdom castle. Metal Sonic once modified himself and turned against Dr. Eggman. Mario and Luigi are twins. Luigi is taller, but is the younger twin. Amy is firmly convinced that she is Sonic's girlfriend. Yoshi has a red shell on his back. Mario likes Princess Peach a lot. Professor Gerald Robotnik, Dr. Eggman's grandfather, created Shadow. In Sparkleton the polar night lasts all through the winter. Sparkleton was named for all its sparkling lights. This page was last edited on January 6, 2018, at 16:17.